Adam McBride and Don Halpern, CEOs of Loctote have one ultimate goal: to keep your belongings safely in your bag. With high-tech materials and a durable build, Loctote is the backpack brand designed to endure everyday city life with all the dangers associated with it. But with a proposal of $150,000 for 15% stake in the company, will the sharks steal this opportunity, or will they walk out of the deal? Every day we carry around valuable and meaningful possessions with us. Whether it’s our phones, our credit cards, or our cash, no matter how careful we are being, the moment we set the bags down, we run the risk of having them stolen. And with technological advancements, someone may even steal your credit card information simply by passing by you! Well, Loctote is a company whose goal is to help you keep your belongings safe no matter where you are! McBride and Halpern first showcased to the sharks the Flak sack, a practical yet cool backpack made out of the most resistant textile available anywhere! But what is it? The material, 5-times more cut-resistant than Kevlar, is actually based on a high molecular weight polyethylene, some other technical fibers, and contains a fairly proprietary weave. The two entrepreneurs then went on to show how resistant the bag really is, even proving that it’s impossible for someone to cut it or slash it with a knife. What about someone just stealing the whole bag instead of cutting it? Loctote even thought about that, including a steel hidden reinforced strap, so you can close the bag by locking it, or even fix it to any stable object. Furthermore, it’s water-resistant, UV resistant, and even blocks RFID scanning, a commonly used method to steal credit card data. The project which initially started with one product, the Flak Sack, is now a company offering a great diversity of safe backpacks for every style, the Loctote! But how did these two entrepreneurs meet? Halpern, a management consultant, first contacted McBride when he was just fresh out of college. With an idea in mind, but with help with social media, marketing, branding, and website development, these two were a business match made in Heaven. When it comes to costs, each Flak Sack costs $179 retail, with a production cost of $75, which is quite a high cost of production but the entrepreneurs mentioned that the fabric is proprietary, thus raising the production cost. Furthermore, the bags used to be manufactured in the United States, which increased the production cost. Once the entrepreneurs hired a strategic partner and decided to start producing the bags overseas, which not only allowed them to cut production cost to less than $15, but also shortly after they were approached by large retailers asking them to sell the Loctote in their stores. After first launching their project on Kickstarter 5 months ago, with a goal of $18,000 to start manufacturing, they ended up raising over $855,000! But that wasn’t enough for the two ambitious entrepreneurs! Next, they decided to post on Indiegogo, a website similar to Kickstarter and within 60 days of launching the product, the combined money raised using these two platforms reached over a million dollars. With a short lifetime of just 5 months, Loctote has already reached $1.4 million in sales! It’s also quite impressive to know that they sell to over 75 different countries. Although McBride started off as a key employee, he doesn’t have any equity in the company right now. Robert was the first shark to offer his opinion on the product. He couldn’t understand the fundamental application of the bag, that is, he doesn’t believe people in a casual environment are going to lock up their backpacks. Halpern further explained that with half the sales being overseas, the main reason people buy Loctote is due to the anti-cutting material, rather than the locking feature. Next up, Daymond focused on the “hanger appeal”, that is, that just by looking at a bag in a display, it’s hard to know what makes this specific bag unique, and therefore backed out of the deal. Robert decided to continue with Daymond’s comment and ask how the entrepreneurs are thinking about selling the bags. Halpern explained that initially the sales would be done online, which would include a lot of funny videos and different content so the general consumer would have a better idea of the bag’s value. Mark decided to intervene and say he would not invest. He further explained that, although going viral with a funny video can translate into sales for a short time, Loctote would have to continuously create new content for the remainder of the company’s life, which is quite different and less demanding than creating content for a Kickstarter or Indiegogo campaign. Coming back into the offer’s table, Robert then mentioned that he believes the company hasn’t been proven yet by the reality of the marketplace and how brutal it can be. Unfortunately, Robert dropped out of the deal too. In an unexpected turn of events, Halpern mentioned he knew how brutal life can be. 4 weeks prior to shooting the show, he was diagnosed with an aggressive type of cancer and since then has had 2 surgeries. 2 weeks after the surgeries he was on a plane, against his doctor’s advice, in order to meet with Walmart in order to show them the complete product. According to him, this drive and strive for the best is what makes Loctote great and, ultimately, will translate in the company’s success. After this emotional statement, there were only 2 sharks left still on the race. Lori was the first one to share her opinion. She claimed that the uniqueness of the bag resided in its anti-slashing technology, although slashing someone’s bag is quite an unusual way to steal something. She also mentioned that, although it locks, you can buy any locking device to achieve the same effect. Lori continued on to claim that the big problem for her is the current price point, which eventually led her to not want to invest. Kevin was the last shark still interested. He believes the company should not sell in Walmart, and rather focus on their social and digital strategy used so far. He also mentioned how high the price point is. Although he had quite a lot of reasons to back out of the deal, he decided to make an offer of $150,000 for 10% and $10 per bag until he gets $450,000 back. The offer was not up for negotiation, and Kevin even went on to say it’s a “take it or leave it” deal. The entrepreneurs then mentioned their desire to move into retail with their lower-end products, so a continuous line of credit would be needed. Not only did the shark and the entrepreneurs disagreed on whether or not to move into retail, they also disagreed on the equity amount and royalty proposed. After this indecision, Halpern decided to renegotiate: $150,000 for 10% equity and $10 per bag until the initial $150,000 were recouped. In a stunning maneuver, Robert said he would take that proposal and ended up making a deal which impressed Mark Cuban. 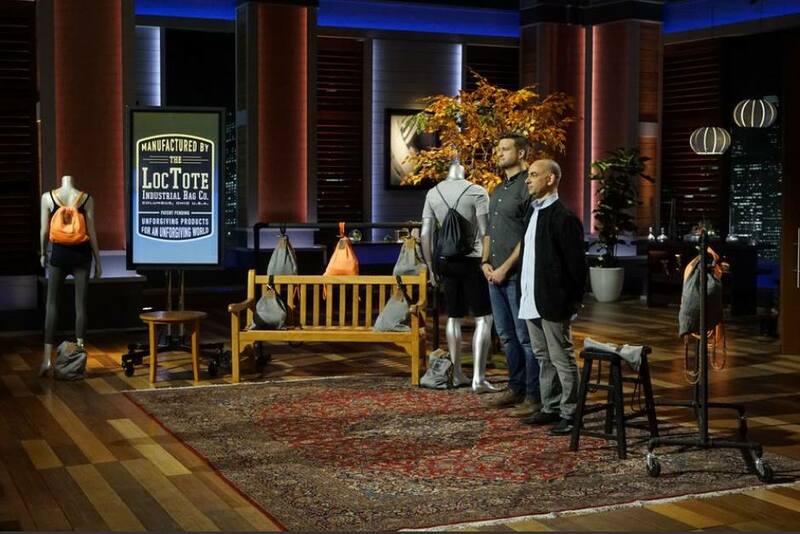 What happened to Loctote after Shark Tank? The show has just aired so it’s still not possible to get any updates on this fantastic deal. We wish the entrepreneurs all the best and hope Halpern will keep on fighting. If you would like to know more about the company, make sure to visit their website loctote.com or you can get your own Loctote anti-slashing bag online. Company/Product: Loctote Industrial Bag Co. 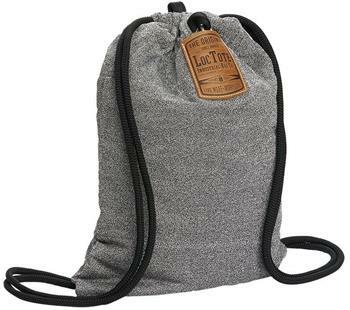 The Flak Sack is the toughest drawstring backpack designed to protect your valuable essentials. This bag is made of double-layer of HMWPE slash resistant fabric. This bag also protects your important things such as your credit card from unauthorized scanning thanks to the iInternal pocket with a certified RFID. The fabric is pre-treated with industrial grade water repellant so make your bag water-resistant. The steel reinforced locking strap and brass lock help you lock your bag to any secure object and leave it without worrying about it being tampered with or stolen.